2019 will welcome in the Year of the Pig on the 5th Feb for Chinese New Year! In 1865 gold was discovered on the West Coast of New Zealand. Local Otago businesses lost customers as large numbers of European miners left to go to the new goldfields. In an effort to encourage more customers and to ensure that gold continued to be extracted from the area, the Otago Provincial Government asked Chinese miners to come and work here. At first the Chinese miners came from the Australian goldfields, but many came directly from their homeland in the Guangzhou province in China. During the early 1800s many people from the Guangzhou province in Southern China lived in poverty. There was high unemployment, the area was over populated and still suffering the effects of the Opium Wars. One solution to escape the cycle of poverty was for families to pay for brothers and sons to travel overseas to work on the goldfields that were opening up. 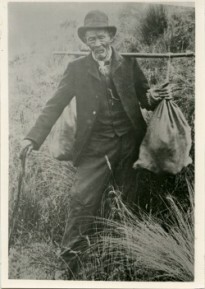 Large numbers of Chinese miners went to the Californian and Australian fields, but some also came to New Zealand. 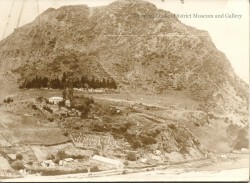 One of the places you will visit during your time at the Museum is the Arrowtown Chinese Settlement. It is a great way to get a hands-on insight into the lives of these miners. In 1983 the Department of Conservation carried out an archaeological excavation in the settlement. While two of the buildings are original, the rest of the buildings were reconstructed using photographs and the same materials as the Chinese miners would have used. The vertically placed slabs of stone and flat metal sheeting found around the hut... were placed there by the Chinese to prevent rabbits burrowing under the walls of the huts and into the gardens. Brainstorm some questions you think an archaeologist should ask when they are investigating the Chinese village. For example - What building materials are used? Why? How many windows are there? Why? Think about how these questions will help you learn about the lifestyle of the Chinese miners in Arrowtown. There are two different European attitudes towards the Chinese miners shown in this article. Can you identify them? Compare the attitude of this author with the attitude of the author below. 'Gentleman, our miners and their families have left for the goldfields of the West Coast. In 1866 there were less than 200 Chinese miners in Otago, but by April 1868 the Chinese population had increased to 1270. The population peaked in 1871 with just under 5000 miners. By 1921 due to anti-immigration legislation there were only 59 Chinese in New Zealand. Chinese miners followed one of three major religious beliefs - Confucianism, Buddhism and Taoism. Many rituals are followed to keep evil spirits away or invite good fortune. 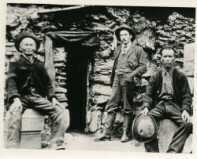 While most miners had small shrines in their huts, temples were built in Lawrence and at Round Hill. OPIUM ... Some Chinese miners smoked opium before they came to New Zealand. Other miners took up the habit because they were lonely and/or hungry - opium is an appetite suppressant. It is estimated that 10% of Chinese miners were addicted to opium and 60% smoked it occasionally. This video has some short excerpts from the film Illustrious Energy - which follows two Chinese settlers prospecting for gold in 1890's Otago.